Located Avenue at 6950 Noritsu in Buena Park, CA, Fairmont Designs manufactures and designs beautiful furnishing options for hospitality locations. The company produces top-quality casegoods that can be produced within reasonable timelines. Providing stylish, but durable decorating solutions for their clients. Fairmont Designs provides custom-made furniture its clients are proud to display. The new location had a few obstacles in the way, but our professionals knew the solution. 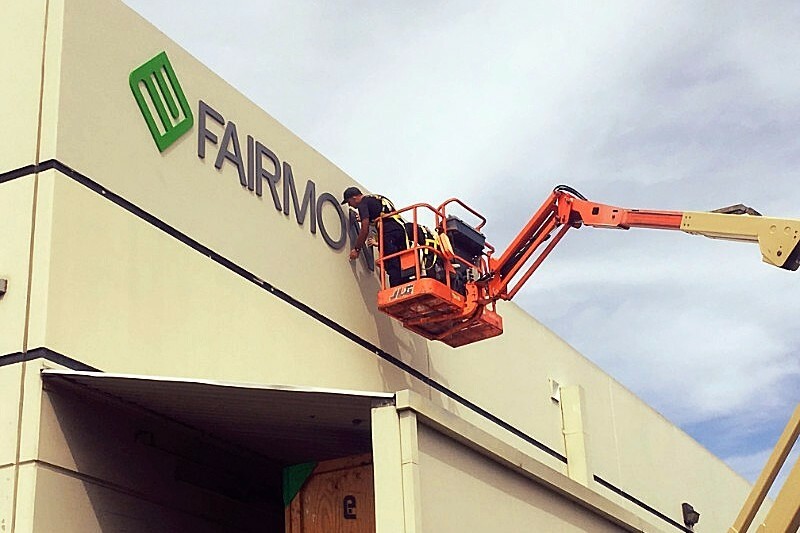 About three years ago, Superior Signs and Graphics worked with Fairmont Designs to create an exterior sign that fit their timetable. 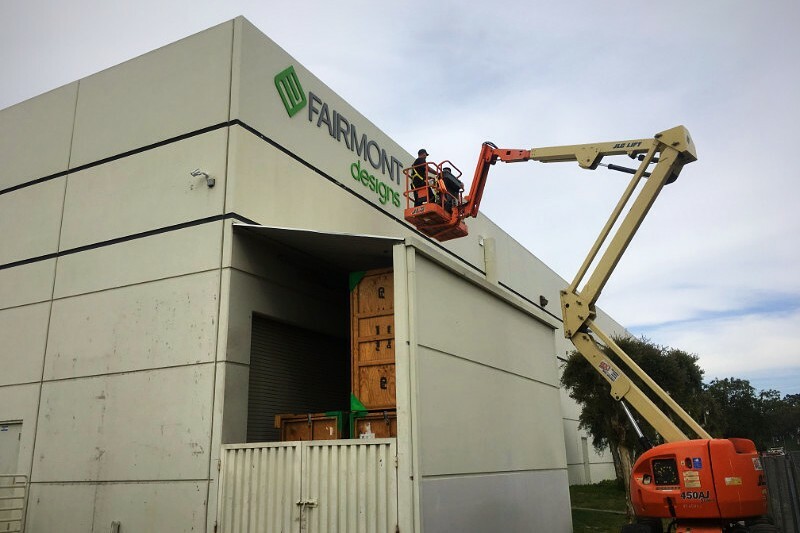 After moving to a new location, also in Buena Park, Fairmount Designs returned to us to come up with a more permanent signage solution. When we arrived, the first thing we noticed was the state of the current sign. The foam letters that were in place had issues with the metal faces of the letters, which led to them delaminating and falling off. Their representatives let us know that they were looking for a more durable solution that would better stand the test of time. Our professional installers replaced the old letters with new ones that will serve as a more permanent solution. Based on their specifications, our team recommended 1”-thick PVC lettering, which was painted to the custom colors of their brand. We also recommended the letters be stud-mounted to the building to give longer life to the sign. Once we got the greenlight, we had a few issues with installation. At this location, there is a shed that had been built below the sign and attached to the building. Even more difficult, the area behind the building was very limited in space, as it the building was nearly up against the freeway. However, our installation professionals had the solution. We rented an articulating four-wheel-drive boom lift and reached the sign location. Once we got to the right location, we removed the old letters, scraping off the leftover adhesive in the process, then drilled the new stud holes in place. After the sign was completely removed, the building got a fresh coat of paint where the old sign was hanging. After everything was matched up and refreshed, we mounted the new sign. 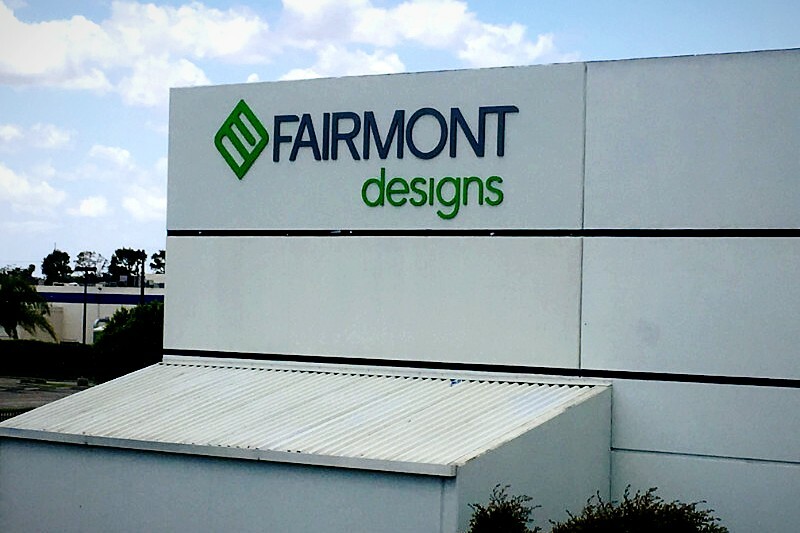 The finished signage is a much-needed update for Fairmont Designs and showcases their beautiful logo. We take on even the most difficult installation processes. With a team of installation specialists, we will give the best recommendations to ensure the job is done well and on time. Contact us to find out how our services can benefit your building.